This spacious luxury villa is located in Lindfields, just 10 minutes drive from the Disney attractions. The villa itself overlooks a beautiful lake and conservation area and the private, fully screened pool attracts the sun throughout the day. A Publix supermarket is located nearby for those all important groceries and numerous shops and restaurants are just minutes away on Highway 192. Several golf courses can be found within a 5 mile radius. 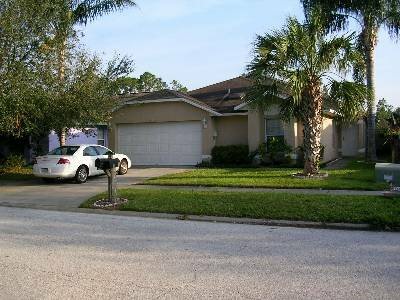 This lovely air-conditioned villa is very homely and has everything you need to make your stay in Orlando as comfortable as possible. · Master bedroom suite with large double bed, ceiling fan and remote TV with patio doors onto the pool. Ensuite bathroom with two washbasins, cute corner bath tub, large walk in shower and toilet. Large closet, extra cupboards and dressing table and storage. · 2 further bedrooms, 1 double and 1 twin, all with large closets and ceiling fans. · Second bathroom with toilet, bath with shower and washbasin. · Spacious open plan dining, kitchen and living area with cable tv, video and dvd player. Patio doors from living area to the pool area. · Washing machine, tumble dryer, iron and ironing board. · Telephone with free calls within USA and to landlines in UK and Ireland.